Serratiopeptidase is a pro-teolytic enzyme, which binds to alpha-2-mac-roglobulin in the blood, there by, helps to mask us agnogenicity but retains its enzymatic activity and is slowly transferred to site of inflammation. It reduces swelling and edema improves microiroculation and accelerates the elimination of sputum by breaking down the liquifying mucus secretions and fibrin clots, hence it acts as anti-inflammatory antiedematous and anti-fibrin-olytic. One of the useful actions of it is that it increases the concentration of antibiotic at the site of infection. 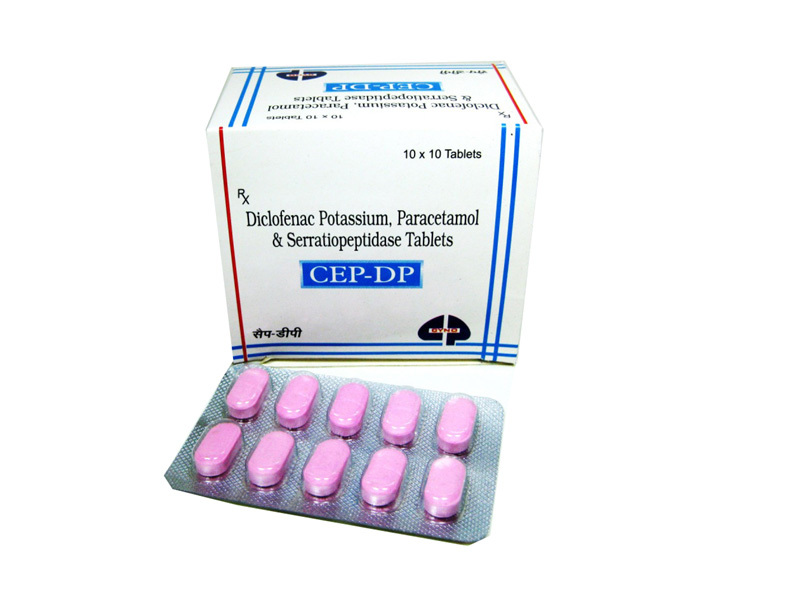 Paracetamol is a non-steroidal anti- inflammatory drug and is a para-aminophenol derivative. It is centrally acting analgesic and a potent antipyretic, but devoid of a significant antiinflammatory effect which could be due to its weak activity on peripheral prostaglandin synthetase. This drug does not produce acid-base imbalance, electrolyte disturbances, and gastrointestinal irritation nor does it effect blood- clotting factors. It also posses uricosuric property to varying degree and are non-addicting. Paracetamol is rapidly absorbed on oral administration. Diclofenac potassium is a non-steroictal anti-inflammatory, analgesic and anti-pyretic drug, which inhibit prostaglandin synthesis by interfering with the action of prostaglandin synthetase. It is ideally suited for patients on sodium free diet, hypertensive patients and those on diuretic therapy. Analgesic and antipyretic postoperative and posttraumatic inflammations. Inflammatory edema and swelling. Inflammation in sinusitis. Muscular and skeletal pain co-existing associated conditions such as spondylitis. Rheumatold arthritis and osteoarthritis engorgement of breast. Painful inflammatory conditions in gynecology. Cystitis epididymitis pericoronitis of the wisdom tooth- third molar. Alveolar abcess inadequate expectoration such as in bronchitis, pulmonary tuberculosis. In CEP-DP patient having a history. GI ulceration hematemesis melena ulcerative colitis and crohn’s disease. Severe cardiac hepatic and renal impairment or insufficiency. Patient under – going treatment with anti-coagulants. In CEP-DP the adverse effects is gastrointestinal diturbances such as anorexia, nausea and gastric discomforts. Rashes. Rarely leucopenia. No drug interaction regarding CEP-DP is reported. Adult: One tablet of CEP-DP should be taken three times in a day orally. It is advised not to take empty stomach.